With age and time, even the brilliantly captured photographs lose their charm and luster, leaving us with heaps of torn, faded, and discolored photos that no longer serve the purpose.. Adobe Photoshop is, undoubtedly, one of the best tools to enhance and modify digital images. 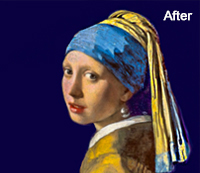 It can be even used to restore images that have been damaged by the effect of age, negligence, and/or nature's act. 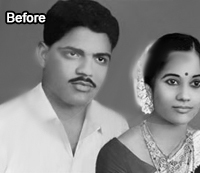 At Outsource2india (O2I), we provide professional services for photo restoration using Photoshop in India. 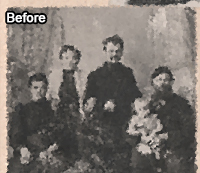 With a team of expert photo restoration specialists, who have unmatched knowledge and years of experience in the industry, we can bring back even the heavily damaged photographs to their original glory. 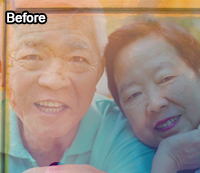 So, whether it's an old photo, a vintage collection, a blurred shot, or a photograph with abnormal exposures, lost color balance, damaged pixels, or other deformities, we can revive it to perfection with our expert image restoration using Photoshop. 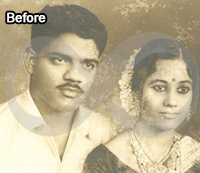 At Outsource2india, we are fully adept at handling even the most fragile photographs and have rich experience of restoring even those photographs that have been damaged by fire and/or water. 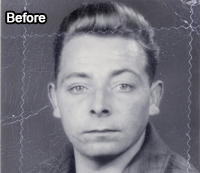 All our photo restoration services are available at competitive rates and can help you save your time, effort, and manpower required to revive your old/damaged photographs. Printed photographs don't last forever. That's why our image editors and Photoshop experts skillfully convert your printed photos into digital copies to enhance their life. We incorporate the latest technology to process your images and ensure that you never have to compromise on quality. 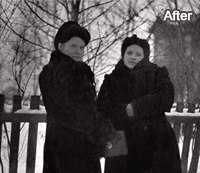 Reproduction of a photograph that has been heavily damaged due to time or nature, or has missing or torn parts, demands complete knowledge of the photo restoration process and unmatched patience. Experts at O2I have most advanced levels of picture editing skills and can efficiently reproduce your old photographs in high resolution and superior quality. 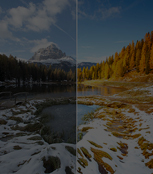 They can even balance the color, contrast, and brightness of your photographs and optimize their tone for unmatched results. 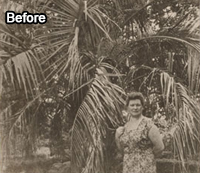 We can help you repair and reconstruct your water damaged photos too. 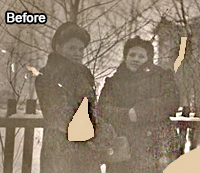 By reconstructing the missing area and filling in the damaged parts, our Photoshop experts try to reverse the effects of water and effectively bring your photo back to its original condition. 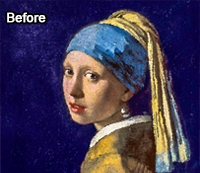 At O2I, we use the latest versions of the image editing software (Photoshop) and Photo enhancing techniques to remove unwanted colors and stains from your photographs. Our photo restoration specialists can efficiently remove all marks of stains made by coffee, ink, as well as water, and remove all distracting images and shadows that are interfering with the natural composition of the photograph. 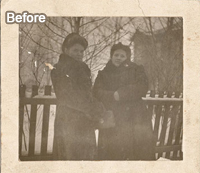 We can skillfully reproduce and restore even those photos that have missing or torn parts. 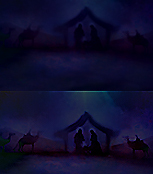 Using specialized techniques that involve image restoration using Photoshop, we reconstruct the image in such a way that no signs of restoration are visible at all. 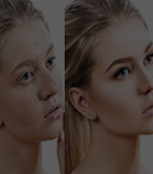 Whether you want to straighten a crooked image, apply filters to reduce noise, fix damages spots, or make color adjustments, experts at O2I can help you enhance the quality of your image using various advanced Photoshop techniques. Our digital "makeup techniques" can help you remove even the slightest signs of marks and blemishes for that perfect photographic look. Using some of the high-end retouching techniques, experts at O2I make even your old photographs look cleaner, clearer, and highly attractive. Our photo enhancement experts provide professional photo enlargement services to give your precious family photos a second life. They can help you enlarge any old photo within a fraction of minutes without disturbing its crispness, clarity, or resolution of pixels. 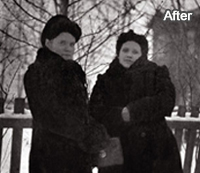 Revive your black and white photographs to life with our color correction and photo tinting services. 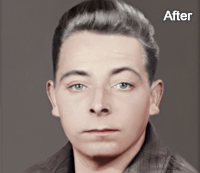 Our experts, with our offshore photo restoration services using Photoshop, can add color and charm to all your old photographs as well as restore the colors of photos that have faded with time. Why Choose Outsource2india for Your Photo Restoration Needs? Experts at O2I have unparallel expertise of working on even the most detailed photo editing and restoration software like Adobe Photoshop CS, Adobe Photoshop CC, and more. 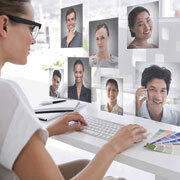 This allows them to easily restore all your photos to their full potential. 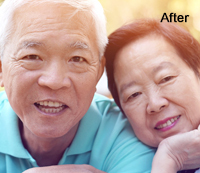 Our in-house team of experts has over 20 years of experience in photo editing and restoration and can quickly and easily give all your images a touch of brilliance for high-quality results. 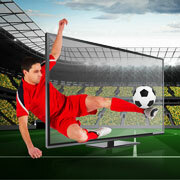 We adhere to complete professionalism in all our projects and never miss our deadlines. This helps us ensure quick delivery of all our projects. We have stringent quality standards and perform rigorous quality audits to ensure that our projects always supersede your expectations. 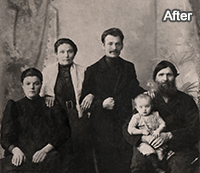 By outsourcing your photo restoration requirements to O2I, you can hugely save on in-house setup and production costs. 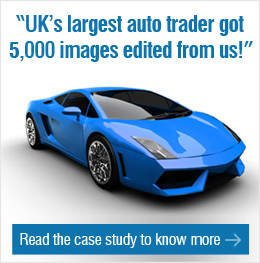 This will also help you ensure that you get top-quality results at a competitive price. Our customer support executives are available 24/7 to ensure complete customer coverage and timely address any queries and concerns. For professional photo restoration services at competitive prices, outsourcing Photo restoration using Photoshop to O2I is your best bet. We ensure quick service, unmatched results, and timely delivery of all projects for complete peace of mind. Simply let us know your requirements by filling out our Contact us form and experts at O2I will get in touch with you back to you within 24 hours with a customized service plan that's designed exclusively for you.